A remote control monster?! Yes, B was all for it! 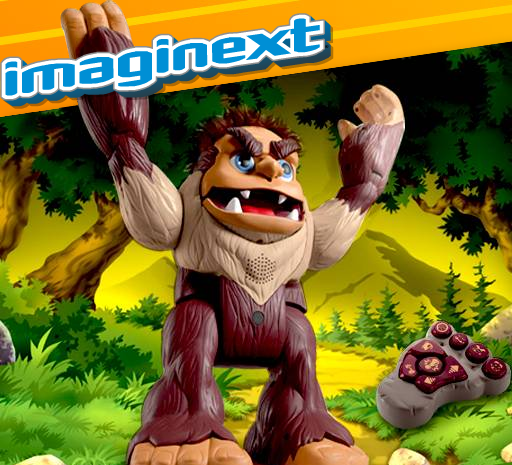 Plus, the Imaginext BIGFOOT the Monster, really airs more on the side of friendly, and funny. Fairly sizable, B was amused by all of the things that BIGFOOT says's and was even more excited when he figured out that he does tricks! Throw the ball, feed him, take him for a walk; with a remote control that offers various functions, there's so many thing's to do! Of all of the fun functions offered B has the most fun (and rolls of the floor laughing in delight ever time!) when BIGFOOT throws the ball! With so many interactive options, BIGFOOT has provided hours of fun and laughter in our home, I'm sure there are many more to come. BIGFOOT the Monster has been a huge hit in our house! 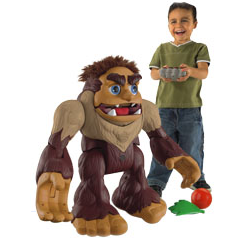 For endless hours of fun bring home BIGFOOT the Monster this Holiday Season! Leave a comment~ Visit http://www.fisherprice.com/ and let me know another item that you'd love to gift this Holiday Season. The comment is considered your entry. I entered the Cuisinart 8 Bottle Private Reserve Wine Cellar Giveaway. I entered the Toshiba Helios Black 17.3" Satellite Laptop PC Giveaway. Both of my GIRLS are so entranced with Bigfoot - they stop to watch him in the store display every time we see him. The other FP item I'd really love to gift my youngest daughter this year is the iXL 6-in-1 Learning system. The MP3 player feature, along with the interactive story would really capture her attention! I would love to get my kids the kid tough camera. I would love to give my niece the Happy Songs Coupe - Pink. either the vtech or mobigo! this is the only thing on my daughter's christmas list! I added your holiday button to my blog!! entered the little pets collection!